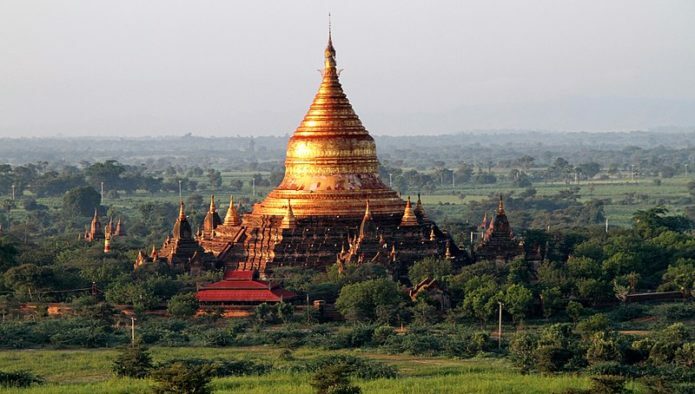 Watch this space, Myanmar is a name you’ll soon be hearing on every traveler’s lips! This once hermit military dictatorship has begun opening up to foreigners and is already drawing eager crowds of adventurers from across the globe. Not only that but it’s tourism potential is huge with incredible vistas, historic architecture and fascinating culture meaning that the need for foreign language education is growing and attracting many to teach English in Myanmar. Before Travelbud was started, our founder Liam Kelly traveled to Myanmar as part of his break from teaching English in Thailand. He went in the year 2012 and it’s interesting to see how six years later we have added Myanmar as one of our teach abroad destinations. Myanmar is one of the most fascinating countries in Southeast Asia, it’s just opened its doors to the world after some regime and policy change. It’s still an untapped territory for many travelers. Venturing to Myanmar at this time really feels like travelling to all of Southeast Asia at once. A rich mix of Buddhism and diverse local cultures like the Mon, Shan and Burmese makes it a very colorful combination of people and lifestyles. When exploring the country, you feel a sense of being one of the first to experience this buzzing local environment filled with adventure opportunities. In this article we will be highlighting some of the places Liam visited during his trip there, where he and a friend traveled using various modes of transport, including taking the train, renting a boat and hiring motorbikes. He started his trip in Bangkok where he flew to Yangon on Air Asia ($60), getting the visa was an easy online process. Although it might sound like an obvious choice, once in Yangon Liam found the Shwedagon Pagoda a must visit. Despite being arguably the most famous Buddhist site in Myanmar, it’s anything but a tourist trap. With an unknown date of construction, it presents a mythical world filled with rich Burmese culture and wealth. This is one of the most famous and impressive pagodas in the world. It sits on top a hill, which means you can see it from almost anywhere in Yangon during day and night, as the gold roof lights up the city. A lit up Shwedagon Pagoda. The next place Liam visited was Inle, this is one of the biggest tourist attractions in Myanmar. It is famous for the Inle Lake which is about 13.5 miles long and 6.2 miles wide. It sits in between two mountain chains, and on either side of the lake you can see towns and villages with houses standing on stilts, which is a breathtaking view. A small village along Inle Lake. The most popular mode of transport on the lake is by boat, boats trips usually start at the town of Nyaung Shwe. There is a $9 entrance fee to enter the in lake area. Once in the inner lake area you can rent a bicycle for $1.10 to cycle around the eastern side of the lake which has some beautiful scenery including on-lake schools, floating gardens, farms on water, lots of temples and water buffalo swimming which is a must see. This next part of the trip was one of Liam’s highlights, as he along with his friend hired motorbikes to travel from Hsipaw to Namhsan which is about a 43 mile road trip. This is one very scenic route with beautiful mountain ranges which feature quite significant elevation changes as you wind up and down the rugged mountain roads. Once on the route, you can find authentic hillside home coffee and sweet shops. The locals are very welcoming and very engaging to tourists, they try their best to communicate in English to you. Our founder Liam (right) and his friend Tyler during their Hsipaw to Namsan route. The last place Liam visited was the city of Bagan, the city is divided into New town and Old Town. New Bagan was developed in the early 90’s, where residents from Old Town were forced to vacate in an effort to preserve it as a UNESCO World Heritage Site by the government. This new dusty town offers a range of accommodation and eating spots, here you will find a very impressive food market filled with local traditional cuisine. The most popular area in this region is Nyaung U, it is a place where tourists can meet fellow travelers to mingle and share their experiences. Local food market in Bagan. Old Town, which is 4km from Nyaung U, is arguably the highlight of Myanmar. It features the UNESCO World Heritage Site of more than 2200 ancient Buddhist monuments built between the 10th and 14th century. It’s a breathtaking scene of an ancient kingdom with monasteries, temples and stupas. One of the the most tranquil experiences here is taking a hot air balloon over the temples during sunrise. Another option is to actually cycle through this historical kingdom’s capital, there are plenty of bicycle hire outlets. It’s an awesome way to get a feel for the more than 10,000 year old kingdom’s heritage. For food, Weather Spoon’s restaurant and bar, a crib on the popular UK pub chain, is a local gem with amazing burgers and Pizza. It has great reviews! Hot air balloons during sunset. This is a country with some exceptional and truly mind-blowing scenery, the people have a relaxed energy and are truly fascinated by foreigners, and the more remotely you travel, the greater this sense of wonder becomes. It’s an incredible time to explore Myanmar, before development and awareness catches up to the tourist potential the country has and throngs of organized tour groups descend on its beauty. If you’ve got a spirit for adventure, an open mind a love for the warmth of the human spirit, this is a destination for you!